Last semester, Zoe and Zak returned the first lost Noble Truth to its rightful home. Now, Zoe and Zak are back in India for their second semester at Moonstock Himalayan Academy. School kicks off with the Activity Week Challenge in the tiny mountain kingdom of Bhutan where the students must deliver medical supplies. Things, however, take a turn for the worse, when Zak becomes deathly ill after an encounter with a strange floating bubble. On returning to Moonstock, Zoe and Zak discover that a creature has come through the lava hole far below their dormitory. When Zoe and Zak follow the creature, they soon discover what they must do. They have been tasked with finding the second lost Noble Truth — the Tiger Eye of Justice. Finding the Tiger Eye sounds like an impossible mission, and it’s only made more confusing when Zak discovers that he has been given a supernatural power to help them with their task– a power which Zak, for the life of him, just can’t control. But he’s going to have to learn how to use his new ability, because if Zoe and Zak can’t find the Tiger Eye quickly, Zak’s time will run out. 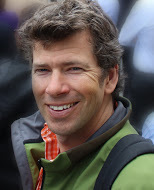 Middle-grade novelist Lars Guuignard has done it again. With a curry-flavored flourish he has gathered all the ingredients to create a recipe for adventure that's sure to whet the appetite of any action-loving reader, large or small. There's nothing small about the new quest in which familiar heroes, Zoe and Zak, quickly find themselves embroiled. 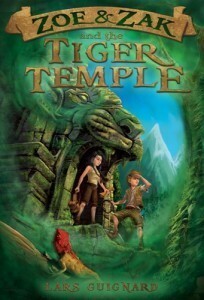 Readers familiar with the series (of which Tiger Temple is the third), will remember to children's search for the First Noble Truth in Book 2: The Yogi's Curse. Well, where's there's a first, there is bound to be a second, and when a supernatural creature worms its way up through the lava hole at mysterious Moonstock Academy, the young adventurers soon realize that they must secure the Tiger Eye of Justice. Thus far, Zoe has driven the plots of Mr. Guignard's books. Readers are in for a treat, however, as this book sees Zak to begin to truly come into his own. He receives a new power which will prove invaluable to their quest. But, if he cannot master his newfound abilities quickly, the clock will run out of time. When contact with a strange bubble afflicts Zak with an inexplicable ailment that threatens his life, readers will be rooting even more strongly for him to pull through. For news about new releases, please join his email list by contacting the author: Zoe&ZakAdventures@gmail.com. Omigosh Melinda - you have the best post title of the tour! lol I also really liked how Zak came even further into his own in this book. I'm glad you enjoyed the series. Thank you so much for taking part in the Tiger Temple Blog Tour. Hi Melinda-- Thanks for the read. Sometimes it's tough balancing the story between Zoe and Zak, but it's good to know that you enjoyed Zak stepping forward. As he finds his way, we'll be seeing more of that. I'm also glad the historical stuffed stayed entertaining. Like always, it's about balance!